The kitchen has pots,pans,silverware,coffee maker, blender, microwave, stove, fridge etc. The livingroom has a large couch, recliners, small library, and sleeper couch. We have satellite television and a stereo and vcr for your enjoyment too.The lodge has free movie videos and a propane fireplace. Loft area provides added sleeping area and game/ tv room. 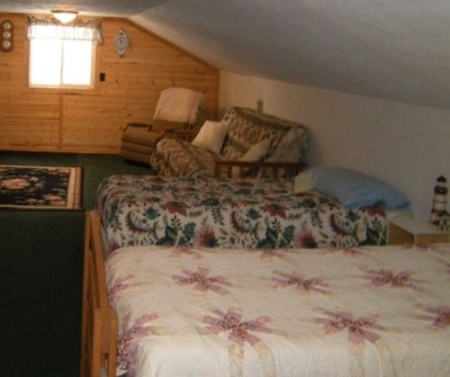 Its 14 by 32 so offers a getaway for kids or privacy for adults. The bathroom is complete with shower and towels. The master bedroom has a queensize bed. The guest room has two full size beds. There is a pull out bed that is also available. 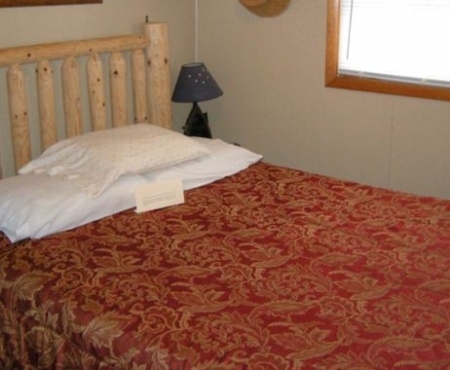 The lodge very comfortably sleeps 6 adults and has forced air heat. The bedrooms have linens provided however no exchange linens. There is a washer and dryer in the basement so you don't have to stop your enjoyment and travel to a laundry mat. We recently added a shower in the basement and provided an area that a futon bed can be used as an additional sleeping quarters. A pay-phone is on premise inside the lodge. However, calling cards do not work very well on the phone so please bring some extra quarters. There is a large 10 by 20 deck with a gas bbq grill, lawn chairs and a picnic table for your enjoyment. The deck provides an excellent view of the deck and beach area. The beach provides excellent swimming opportunities with the beach gently sloping in to the lake. The dock is 32 ft. long and provides excellent fishing right off of the end of it. There are fish cribs and a manmade rock shelf that attract fish right off your beach and dock area. The lake provides great swimming, fishing or just plain old relaxation. 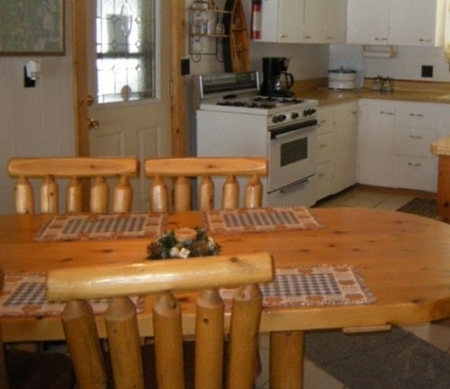 The lodge comes with a 14 ft. boat, 14 ft. canoe, life jackets and oars are provided. We do offer a boat motor rental for a nominal fee for the week. Pontoon boat rental is also available. Fish that are commonly caught are perch, pike, crappie, and small mouth bass. There is a fire ring by the lake. Come and relax by the fire on Powell Lake and listen to the sounds of the Upper Peninsula. The lake is private with no public launch. It is a real quiet lake. It is spring fed so it is very clean, the water is clear, and the bottom is sandy. The lake is approximately 100 acres and reaches depths of 50 ft. and has camps and houses dotted around the lake. 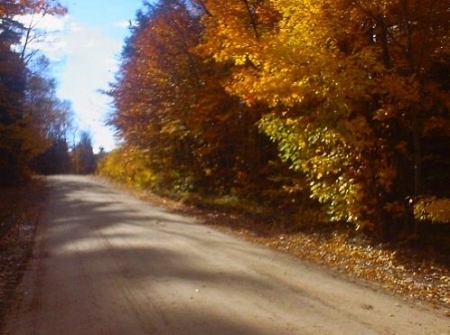 No need to travel to the North Pole for some of the best winter recreation anywhere, Munising and Alger County has it. Snowmobile from your front door. No need to try to beat town curfews, sled at your leisure from our lodge. Pets are generally welcome, but check with us when making your reservation. Due to the family atmosphere on the lake NO RV hook-ups are allowed. 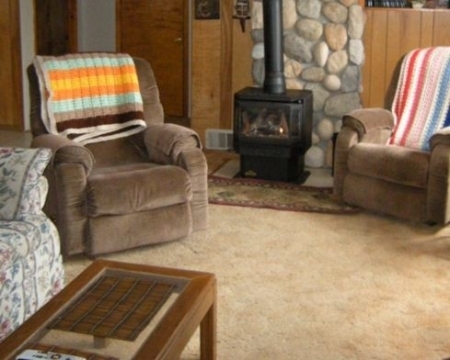 For a family oriented quiet, peaceful and no worry vacation Powell Shores Lodge awaits you. Make us your next vacation destination...whatever the season, you'll be glad you made this your vacation choice.